Several years ago, I began writing an annual update discussing Dalbar’s Quantitative Analysis Of Investor Behavior study. 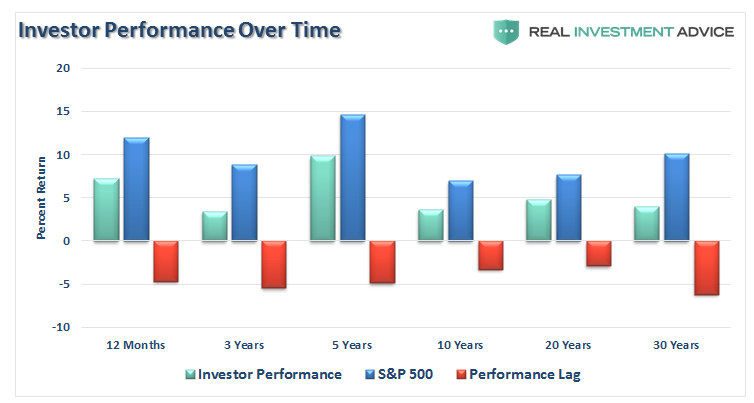 The study showed just how poorly investors perform relative to market benchmarks over time and the reasons for that underperformance. 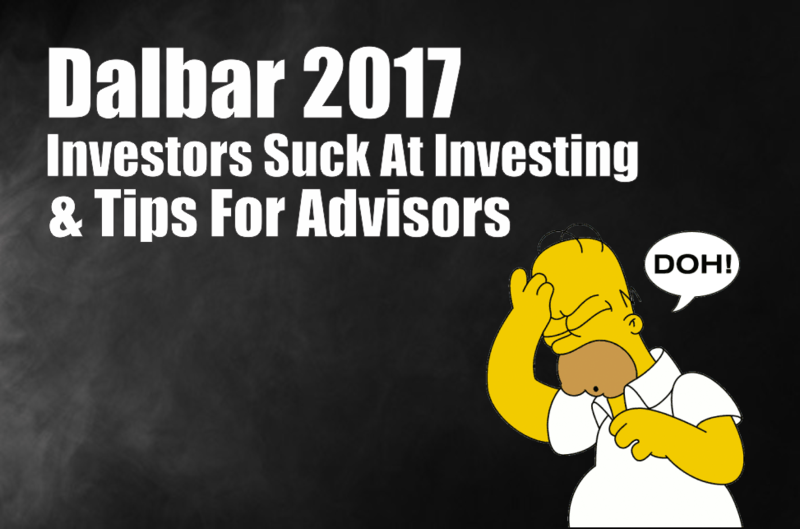 With the release of Dalbar’s 2017 study, I can update, and remind you, of the problems investors continue to face despite the ongoing media and mainstream rhetoric about “investing for the long-term” and other such nonsense like “dollar cost averaging” and “buy and hold” investing. Indexes do not account for the impact of taxes, trading costs, and fees, over time. There are also internal dynamics of an index that affect long-term performance which does not apply to an actual portfolio such as share buybacks, substitution, and market-cap valuation. The underperformance in 2017 directly relates to the psychological behaviors of individual investors. 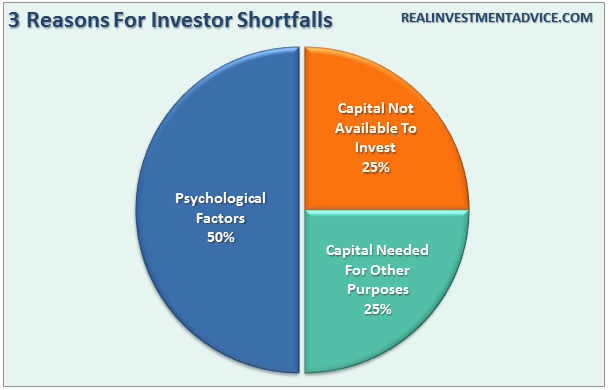 Despite ongoing rhetoric about “buy and hold” and “dollar cost averaging”, both of which are failed strategies as discussed at length here, the reality is that investor psychology is the biggest impediment to long-term success. Of course, there are two main drivers behind both the long-term underperformance of investors and their movements in and out of investments. Accordingly to the Dalbar study, there are three primary causes for the chronic shortfall for both equity and fixed income investors is shown in the chart below. As stated, the issue of “costs” are an important consideration when choosing between two specific investment options; however, the emotional mistakes made by investors over time are much more important. 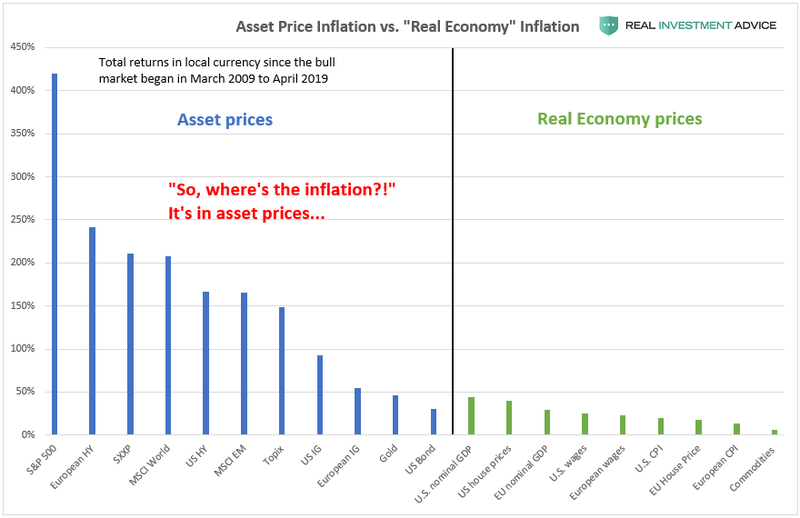 More importantly, while there are many articles chiding investors into “buy and hold,” and “passive indexing” strategies, the reality is that few will ever survive the downturns in order to see the benefits. Chasing an arbitrary index that is 100% invested in the equity market requires your clients to take on far more risk than they likely want or can endure. Two massive bear markets over the last decade have left many individuals further away from retirement than they ever imagined. Furthermore, all investors lost something far more valuable than money – the TIME that was needed to reach their retirement goals. – You can regain lost capital – but you can’t replace their lost time. Time is a precious commodity they cannot afford to lose. – Portfolios are time-frame specific. If the client has 5-years to retirement but a portfolio with a 20-year time horizon (taking on more risk) the results will likely be disastrous. Understanding how individuals respond to impact events will allow advisors to get in front of their clients to discuss the planning, preparation, and response to an impact event and recovery. So, do yourself, and your clients, a favor and forget about what the benchmark index does from one day to the next. Focus instead on matching their portfolio to their personal goals, objectives, and time frames. In the long run, they may not beat the index, but they aren’t going to anyway. So, help them focus instead on achieving their own personal goals. But, isn’t that why they hired you in the first place?